We are one of the leading manufacturer of Laminar Air Flow, Horizontal Laminar Air Flow, Vertical Leminar Air Flow, Leminar Air Flow. During the process of fabrication it is tested for durability and tolerance, and is highly in demand amongst our customers because of affordable cost. We are offering Reverse Laminar Air Flow to our Clients. Motor / Blower assembly: Direct drive, continuous duty ¼ HP with sealed bearings. Motor assembly is mounted on FRP casing to reduce noise vibration and is dynamically balanced. We have to require the semiconsuctorcomprehensive range of high-performance vertical Laminar. Flow clean air cabinets. Modular construction, combining aesthetic appeal with functional utility and efficiency. These are designed to meet the filtration, illumination, Noise & Vibration requirements and US Federal Standard 209 B (BS 5295) Providing air to meet class 100 (class I) conditions, to the extent applicable.It is Ideal for microbiological manipulations. work with bioassays sterility testing & research work. 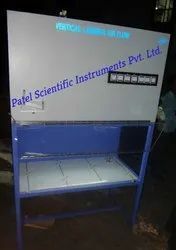 vial filling & bunging operation in parenteral units & for general dry-processemiconductor industry etc. Provides a comfortable 'sit down' working position for the operators. 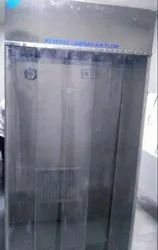 All laminar flow clean air cabinets are basically constructed out of thick CRC sheet - powder coated or thick teak wood board which is termite and insect proof. The work table is made of S.S.304 and side panels of thick transparent plexiglass. Laminar flow principle involves double filtration of air. Atmospheric air is drawn through pre-filter and is made to pass through highly effective HEPA (High-Efficiency Particulate Air) Filters having the efficiency rating as high as 99.99% with cold Dand 99.97% with hot DOP, thus retaining all airborne particles of size 0.3 micron and larger. Double filtered air blows in laminar flow through the work table at the DB designed velocity of 90 ft. min ± 20%. Duly balanced, direct drive motor blower units sized to provide adequate airflow volume over the entire surface of HEPA filter.Fitted with standard make motor and operates with minimum noise level i.e. lower than 6dB on scale and vibration less than 2.5 um. Work area properly illuminated by diffused, glare-free fluorescent Light. Horizontal Laminar Airflow System ideal for Microbiological manipulations, work with bio-assays, sterility testing, and research work; Vial filling and bunging operations in parenteral units and general dry processing work in semiconductor manufacture and Tissue culture work. Horizontal Laminar Airflow (unidirectional Airflow) is a confined area moving in a uniform velocity along parallel flow lines. A continuous wash of HEPA/ULPA filtered Air moving horizontally across the work area. The uniform stream of air filtered air moves forward over the work surface from the rear of the work area. The airflow across the work area directly at the user and exhausts into the surrounding area.